Never one to miss an opportunity to take advantage of a holiday and office closure to travel, my husband made plans last year for us to travel to Washington, D.C. over the Thanksgiving holiday. A few days of rest and relaxation in the nation’s capital while we played tourist is what we had in mind for our quick three-day trip cross-country. Once we booked our hotel for the trip, my husband started looking in the neighborhood we were staying at, and he happened across a little eatery a couple of blocks from our hotel that he told me we had to go to while we were in town. Not only did he think I would like it, he thought that my parents, who were also traveling with us, would really enjoy this eatery. After I had a look at it myself, I had to hand it to my husband, he really knows what I like and what I don’t like, and this was definitely one of those places that I would definitely like. 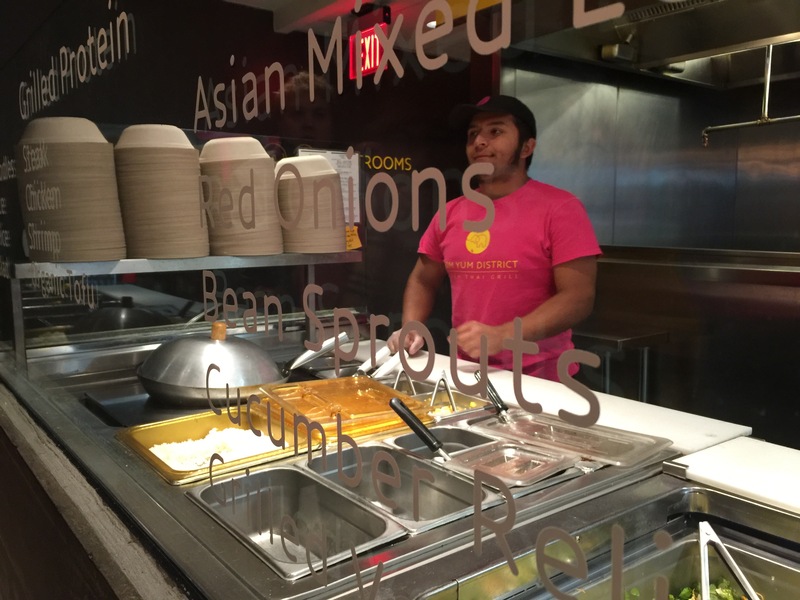 Much like the idea of ShopHouse Southeast Asian Kitchen that I wrote about not too long ago, Tom Yum District in Alexandria, Virginia follows the same idea of create-it-yourself using fresh, quality, tasty ingredients that have been prepared for your liking. However, what makes Tom Yum District stand out from any of these other eateries is that all of the flavors are based solely on Thai cooking. 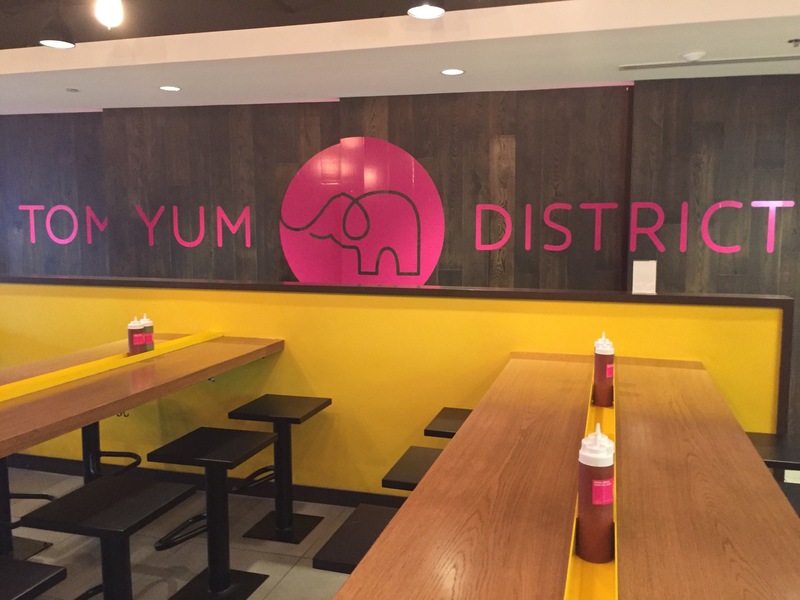 The brainchild of husband and wife duo Aulie Bunyaratahan and Mel Oursinsiri who own two other Thai restaurant’s in and around the D.C. metro area, Tom Yum District is their take on the fast-casual food market. 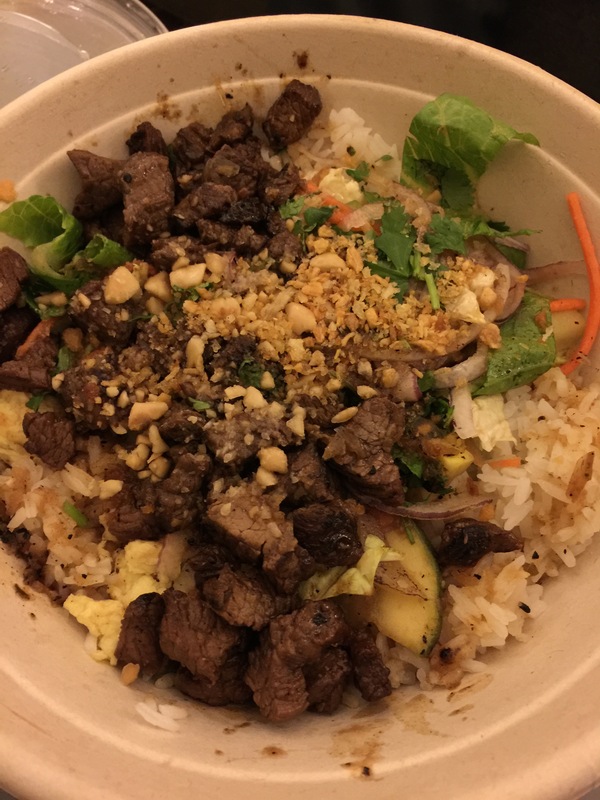 Using authentic Thai flavors, spices and cooking techniques, they bring Thai rice and noodle bowls directly from their open kitchen onto your plate in a matter of minutes. 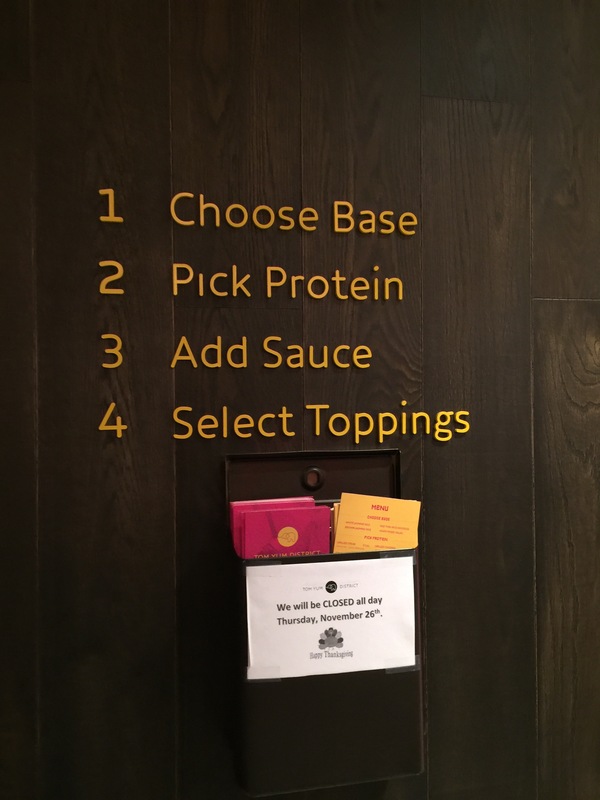 When you enter into the store, you’re greeted with a set of instructions posted along the wall along with printed menus to help you make your decision as you approach the front counter to begin selection your ingredients and putting your bowl together. As the instructions state, you choose first from a base. To the base, you add a protein. To that, you top it with a sauce and then you throw in different toppings. 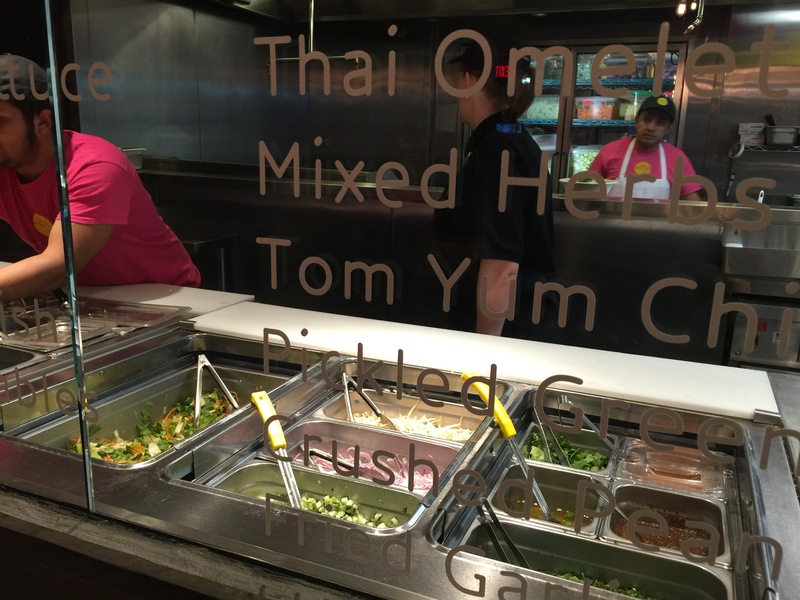 At the end, you end up with your very own Thai-flavored rice or noodle bowl. So let’s start putting together our own bowl. When you’re ready, step up to the counter and start with the base. There are four different options for the base to your bow. 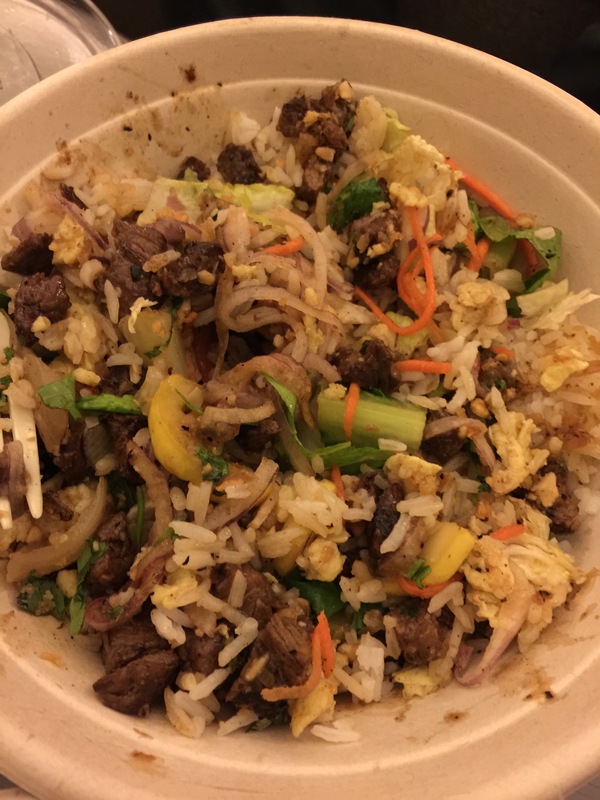 The choices are white jasmine rice, brown jasmine rice, pad Thai rice noodles and Asian mixed salad. I’m Thai, we eat white jasmine rice, so that’s what I chose for my bowl both times we visited Tom Yum District. So a couple of scoops of rice are added to the bowl and you move on to the next step. Time to pick a protein. Again, you’ve got four options: grilled steak, grilled chicken, grilled shrimp and grilled organic tofu. The steak has been prepared using a coriander-garlic marinade, the chicken has been marinated in a lemongrass-numeric preparation, the shrimp has been prepared using a sweet chili sauce, and the tofu has been flavored with a sesame ginger glaze. I’m a red meat kind of girl, so I had to go with the grilled steak atop my white rice. Time to move to step 3, the addition of the sauce. With the sauces, there are 5 different authentic Thai-flavored sauces to add to your bowl. There’s the signature tom yum sauce made with house-made chili paste and lime, classic flavors of Thailand. There’s a panang curry sauce which is a curried peanut sauce and quite popular in Thailand. There’s the drunken sauce which consists of oyster sauce, chili and garlic, again quite popular in Thailand. There’s a lemongrass-ginger sauce made with oyster sauce and a mix of Thai herbs. This is a flavorful, but not spicy, sauce that would go well with any base you chose. And finally there’s a white wine and orange vinaigrette which is sweet and tangy, and that’s a more universal flavored sauce that isn’t so far out there with Thai ingredients. Finally, there are the toppings to add to the bowl, and there are unlimited choices as to what you can add. The choices including Asian mixed veggies of romaine, napa cabbage and carrots, there are bean sprouts, red onions, cucumber relish, mixed herbs which include cilantro, basil and mint, grilled vegetables, Thai omelet, crushed peanuts, and fried garlic. You can add as many, or as little, of these ingredients as you like. You want your bowl nice and spicy? No worries. When you take your bowl to sit down at one of the many tables at the eatery, there are two bottles of chili at each station. There’s the traditional red sriracha sauce that most people are familiar with, and there’s Tom Yum District’s own green Sriracha sauce made from green chilies. If you’re taking your meal to go, you can get these chili sauces to go as well. So, the first meal we got at Tom Yum District, we decided to get it to-go and bring it back to our hotel room to eat. My husband and I ended up creating similar dishes, though with a few key differences. My husband’s bowl (top photo) consisted of white jasmine rice, grilled steak, tom yum sauce, grilled vegetables, Thai omelet, Asian mixed veggies, mixed herbs, fried garlic and crushed peanuts. As my husband is a huge fan of tom yum soup, it was natural for him to get the tom yum sauce. He has no fear of anything being too spicy or packing too much punch. For my bowl (bottom photo), I went with the white jasmine rice, grilled steam, lemongrass-ginger sauce, Thai omelet, Asian mixed veggies, mixed herbs, bean sprouts, red onion, fried garlic and crushed peanuts. My husband isn’t a fan of bean sprouts, while I love them because while they may be a bit bland in flavor, they have terrific crunch and texture. 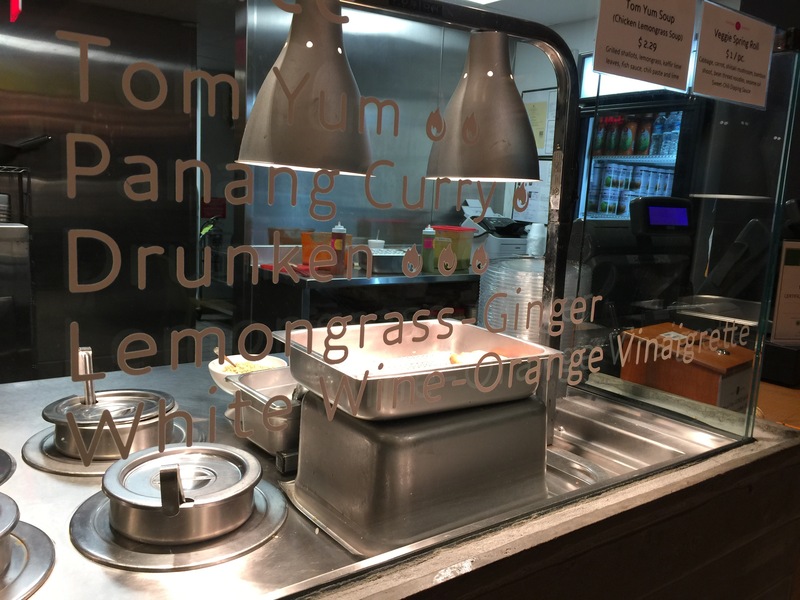 I also went with the lemongrass-ginger sauce as I was afraid that the tom yum sauce might be a little too spicy for my taste buds and I figured that lemongrass-ginger had enough punch and tang to it. I also didn’t get the grilled vegetables because I’m a picky vegetable eater and I wasn’t quite sure what vegetables they would consist of, and if I would eat it, so I opted out. Turns out it was really grilled zucchini, which I would have been fine with. After eating our meals that night, we both agreed that our bowls were delicious. My husband loved the flavor of his tom yum sauce, and while I thought that the lemongrass-ginger sauce was flavorful, I admit that my husband’s tom yum sauce was more flavorful and delicious with a profile that permeated throughout the whole bowl. So, he made the better choice there. My husband thought that the best part of his bowl was the Thai omelet, which is not just like any other egg. Thai omelet is like Thai comfort food, it’s what every Thai child grows up eating. In a deep wok, beaten eggs, generally mixed with a little bit of fish sauce and/or vinegar and maybe some rice flour are mixed together and thrown into a smoking hot wok with lots of hot cooking oil. The egg cooks quickly on one side, is flipped over whole to the other side and cooked on the reverse side. This creates an egg that is crispy and crunchy and golden brown on the outside, but yet still fluffy and soft with many layers on the inside. It’s the fluffiness and flavor of this egg that is then cubed into small bite-sized pieces to create the Thai omelet option at Tom Yum District. 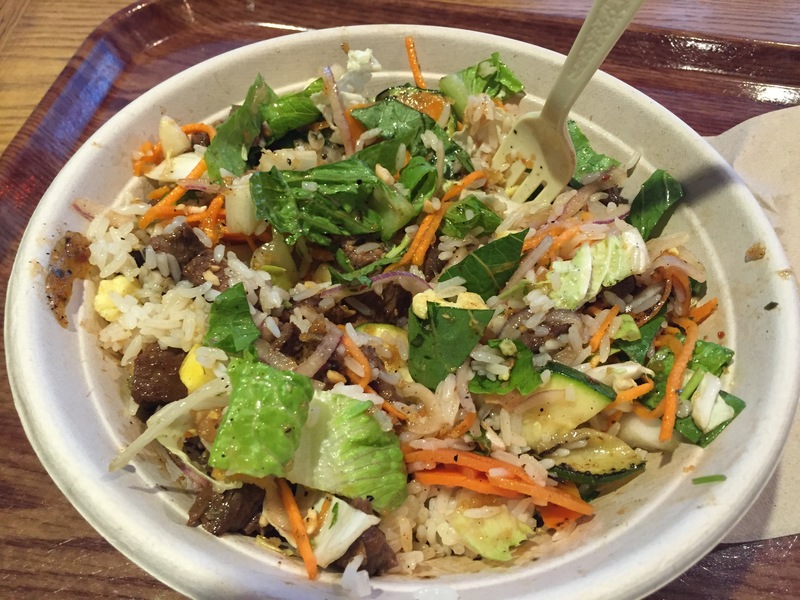 It adds flavor and texture to the rice bowls and is just amazing. What my husband and I both loved about our bowls is that there was so much flavor, and texture, throughout the bowl. You’ve got the perfectly cooked rice, the flavorful protein, the crunch from the peanuts and the bean sprouts, the fluffy egg, the fresh, crisp vegetables, the spice from the sauce, and the crunch of grilled vegetables. It all makes such a perfect combination. And yet, the possibilities of what you can create are endless as there are so many different toppings and sauces, and bases and proteins to choose from. The idea isn’t to just eat the bowl the way it comes. The secret with a lot of Thai dishes is that all of the sauces and the spices are always added at the end of the preparation of the dish. What you need to do is mix everything together. Play with you food a little bit. Combine the veggies with the rice, with the meat, with the spices, with the herbs, with the Thai omelet, with the crushed peanuts. That mixes and infuses the sauces and the spices into every bite of food that you get. You don’t want the spices to just be concentrated through a few spoonfuls of rice, you want to taste it in every spoonful of rice you eat. you want to have a little bit of the veggies, and the egg, and the rice and the protein on every bite of food, and the only way to do that is to actually mix and combine everything together. The second meal we ate at Tom Yum District, which was our meal right before we headed to the airport to end our mini-vacation, we decided to eat at the restaurant. I had to admit this time that my husband made the better choice to get the tom yum sauce in his bowl, so we actually ended up getting almost the same exact bowl this time. Starting with white jasmine rice as the base, grilled steak for our protein, tom yum for our sauce and toppings of Asian mixed veggies, Thai omelet, grilled vegetables, mixed herbs and bean sprouts and red onions for me, crushed peanuts and fried garlic. 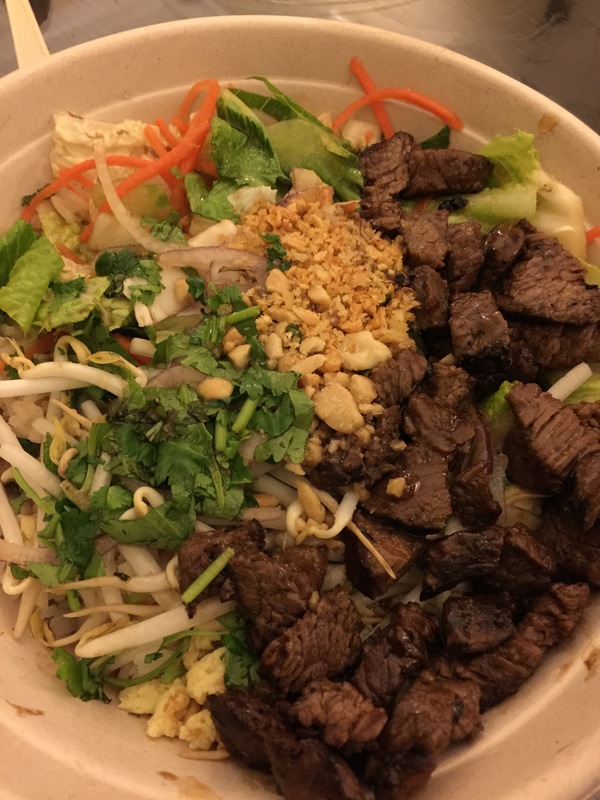 It was so delicious and flavorful that we both devoured our bowls. Even to this day, 6 months later, my husband still talks about how delicious Tom Yum District is. If only we had one of these fast casual restaurants nearby our house in Southern California, we’d be there all the time. Having the ability to make our own meal, the way we like it, with the ingredients we like, is such a terrific concept. Add to that, using authentic Thai ingredients and flavors, and you’ve got a winner. Each bowl is jam-packed with spices, and flavors and textures, and packs such a punch that it just keeps you coming back for more. What this husband and wife restaurant team has created in Alexandria is a real winner and a place my husband and I would never hesitate to recommend anyone give a try. 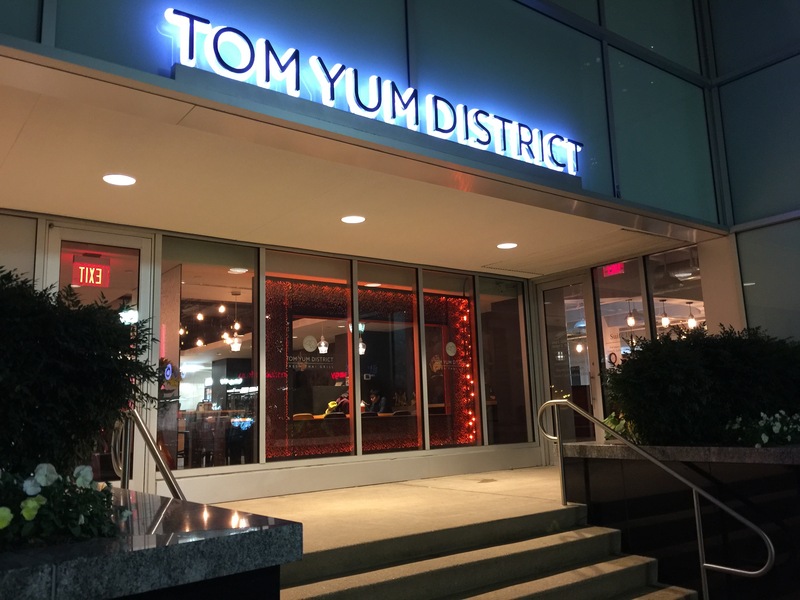 Yeah, my husband did really well when he found this place and told me that we needed to go and have a meal at Tom Yum District when we were in Washington, D.C.